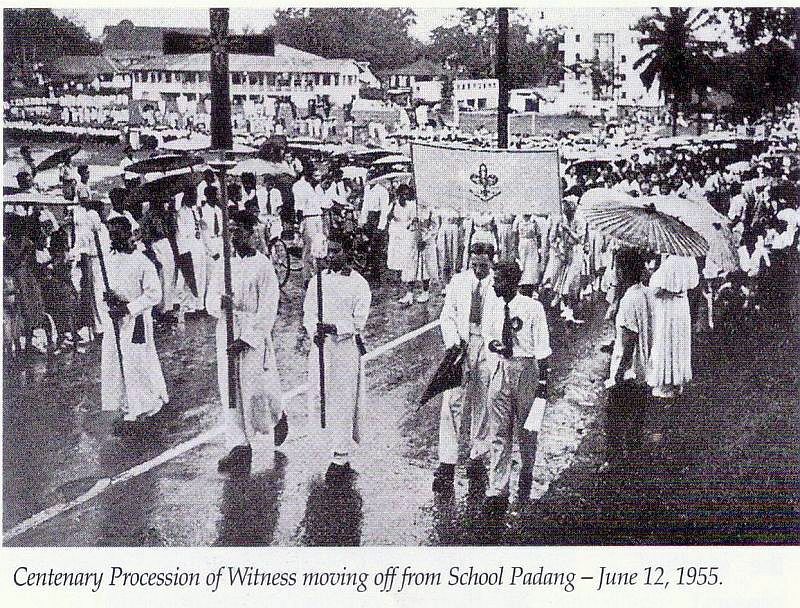 The Procession of Witness in Kuching, June 12, 1955. It was my good fortune to be involved in the preparations and the celebrations. The procession which was to start from St. Thomas’s School playing field must reach the Cathedral in time for church worship scheduled for 6 pm. 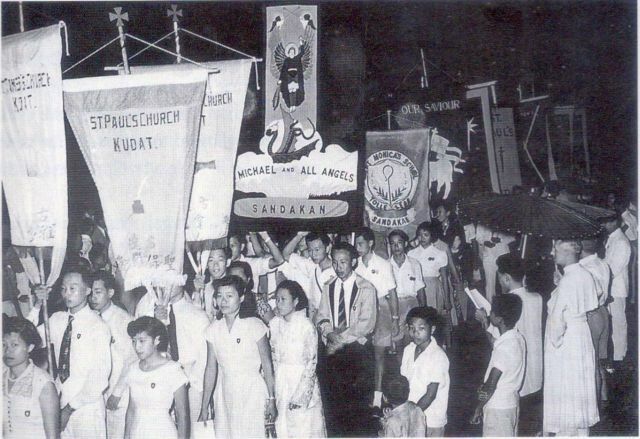 It was my duty to ensure that even the very last contingent reached the church in time. 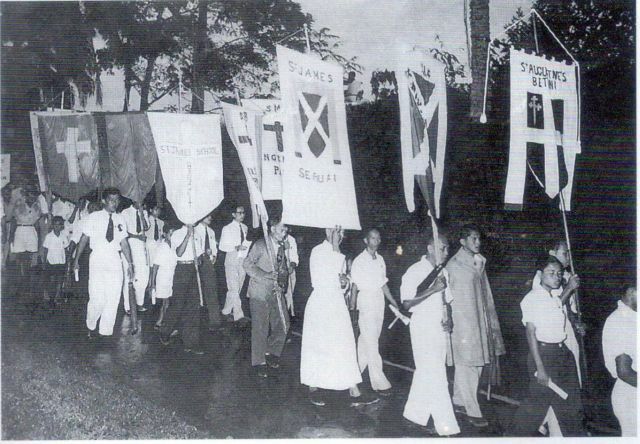 A large number of candles were needed for the procession. I had to come up with a device so that they all stayed alight during the procession and not put out by the wind! I was the only Science and Mathematics teacher in the Sixth Form classes of the school. The Bishop probably knew science teachers can work miracles. For a start, the bishop sent someone to show me the exact route of the procession round the town. Over the next two weeks I walked round the route with a stop watch in my hand and made notes of the times the procession must take to walk between the land marks – mostly electric lamp posts! The preparations produced good results. There were almost 15 minutes to spare in spite of the nuisance of the light showers and winds. I was able to design candle stands using hurricane lamp chimneys at the top, protecting the candles. A large numbers of these were made by the school carpenters and they served the purpose. 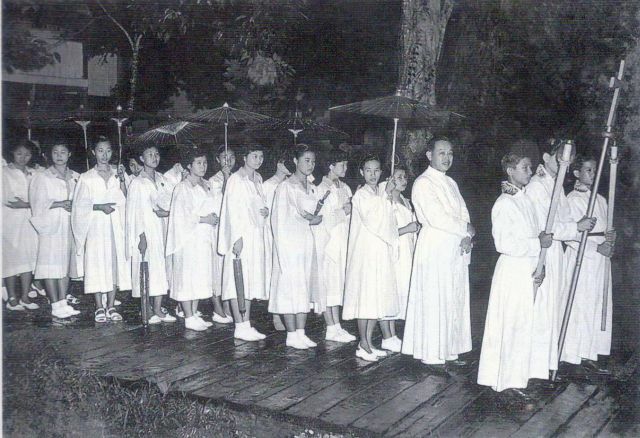 They all disappeared immediately after the procession. (These things have a habit of walking faster than the bearers once the function is over!) Providing light was the easiest of the three assignments. A few hundred yards of wires from the local shops, and plugs and labour from the sixth formers worked the trick. No switches were however provided for the visitors for fear of curiosity tempting them to open up the switches to unravel the mystery. All connections were well above their reach and the switches were all within the laboratories. Poor visitors had to sleep with the lights on until well after sunrise! The Bishop did not say much. Apparently he was a happy man. He continued to give me lift in his car for the weekly hockey matches against the Police and occasional cricket matches in which he also played.